For the past 25 years, NAS file servers have traditionally stored and handled the onslaught of unstructured data. But as global public cloud services exploded, a new type of storage was required, hence the industry's invention of object storage. With many vendors now offering object-level storage for unstructured data, it’s high time to take a closer look at these two storage approaches. To help you choose the right option for your needs, this e-guide illustrates how scale-out NAS and object storage work, their relative strengths and weaknesses, how easy or difficult they are to manage, and how well they integrate with existing infrastructure. 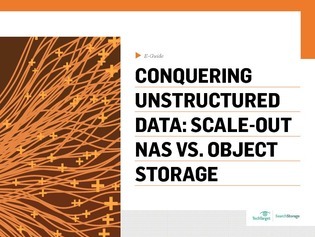 Access now for SearchStorage.com’s full comparison of scale-out NAS vs. object storage.